The Battle of the Clouds (also known as the Battle of Warren, Battle of Whitehorse Tavern, or the Battle of Goshen) was an aborted engagement of the Philadelphia campaign of the American Revolutionary War on September 16, 1777, in the area surrounding present day Malvern, Pennsylvania. 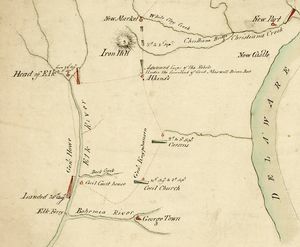 After the American defeat at the Battle of Brandywine, the British Army remained encamped near Chadds Ford. When British commander William Howe was informed that the weakened American force was less than ten miles (16 km) away, he decided to press for another decisive victory. George Washington learned of Howe’s plans, and prepared for battle. Before the two armies could fully engage, a torrential downpour ensued. Significantly outnumbered, and with tens of thousands of cartridges ruined by the rain, Washington opted for a tactical retreat. Bogged down by rain and mud, the British allowed Washington and his army to withdraw. After Washington’s defeat at the Battle of Brandywine, he was intent on accomplishing two tasks. He wanted to protect Philadelphia from British forces under the command of Howe, and he needed to replenish the rapidly dwindling supplies and munitions which were stored in Reading, Pennsylvania. Washington withdrew across the Schuylkill River, marched through Philadelphia, and headed northwest. 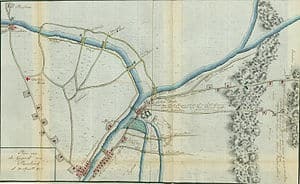 Since the Schuylkill was fordable only far upstream starting at Matson’s Ford (present-day Conshohocken), Washington could protect both the capital and the vital supply areas to the west from behind the river barrier. Yet he reconsidered, and recrossed the river to face the British, who had moved little since Brandywine, owing to a shortage of wagons to carry both their wounded and their baggage. Washington once again withdrew beyond the Schuylkill on September 19 to cover both the capital and his supply area, but he left behind General Wayne’s Pennsylvania division of 1,500 men and four guns with orders to harass the British rear. 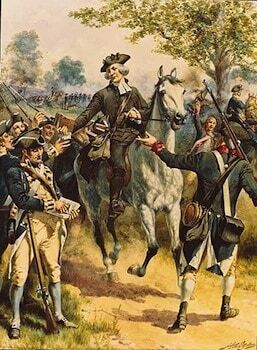 Howe’s army found it nearly impossible to follow Washington over the rutted, muddy roads. The decision was made to wait out the storm, then move toward their objective. Wayne was to be joined by militia, and together they were to strike at the enemy baggage train as the British advanced on Washington’s main army. However his force was surprised at the Battle of Paoli, and the British were free to occupy Philadelphia.